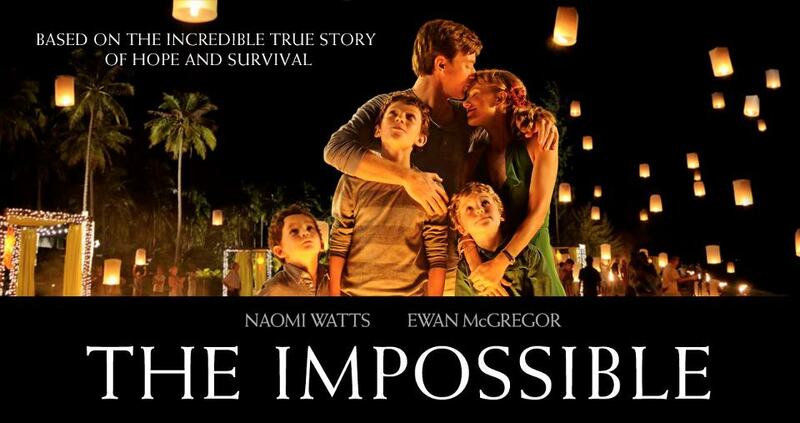 I have never been taken in by a film so masterfully produced in perfect cadence between acting, direction and editing then as the movie, The Impossible. It is based on the true story of the ordeal and survival of the Belon family, Maria and Henry, with their three sons from the horrific tsunami that hit Indonesia on December 26, 2004. The movie sweeps you up with the suddenness of the disastrous wave and you are caught up in the impossibility of the situation. How in an instant and without warning your life and your family’s life can be turned upside down. You are amazed by the remarkable survival of both Maria and her eldest son, Lucas who found each other. Each battered by the debris that tore into their body as two waves tossed them underneath like they were rag dolls. Also, how miraculous it was that separately, Henry and his two younger sons survived. That was not the same story for thousands. Many lost their lives. It is heartbreaking. What you also see in the film is the goodness that came through with most people across all cultures and classes to help each other. Circumstances were dire and most still helped. It was one of the moving elements of the film. It was the hope that shined amidst all the devastation. The reunion of the family is poignant and with that happiness, you feel their awareness and their grief because of the death and trauma of others who were not so lucky. I hope you get to see this film. It will change you. Naomi Watts, Ewan McGregor and Tom Holland gave award winning performances. This movie deserves the highest accolades.